Mission Hills Country Club offers an exclusive, resort-like feel to all its members and homeowners in the area. From 54 holes of golf on three championship courses, to full service practice facilities including a grass driving range and 4 putting greens, this Club is a golfer’s dream. In addition to golf, the country club also offers 29 tennis courts in a top-rate complex complete with its own clubhouse, croquet courts that have won national awards, and a brand new spa and sports complex that is 17,000 square feet of state-of-the-art luxury, a pool complex, and a majestic clubhouse that sprawls over 55,000 square feet and provides stunning views of the mountains and desert scenery. Mission Hills Country Club has dedicated itself to serving its community for the past 35 years, with a focus on luxury and serenity with its gorgeous mountain setting. The private club offers many years of tradition and a passion for excellence among its staff and members alike. Their members want the best, and the club provides nothing less. 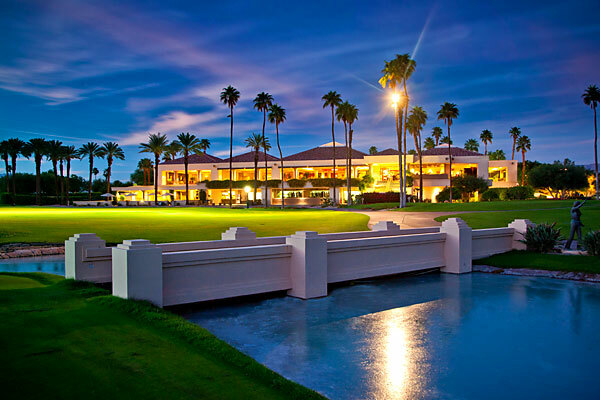 The facilities at this club are unmatched, and it is known as one of the premier clubs in the Coachella Valley. Although Mission Hills Country Club is a private club, it is open to the public for membership as well. There is a social calendar of events at Mission Hills Country Club that has a little something for every member, and offers year-round entertainment and social activity. In addition, you’re not limited to enjoy just this club. With your membership, you receive Associate Club privileges, which allow you to enjoy all of the benefits when you’re away from home at over 250 private country clubs, dining clubs, golf clubs, and destination resorts around the world. Members are entitled to choose their status and usage level at these destinations when they travel. There are many well known annual golf events that take place at the Mission Hills Country Club, including: U.S. Open Qualifier, LPGA Section Qualifier, the Kraft Nabisco Championship, PGA Club Professional Championship, and PGA and LPGA qualifying schools. The golf facilities are what Mission Hills Country Club is known for. They have a 17 acre driving range, four putting greens, a chipping green, and private golf lessons through the Golf Academy at Mission Hills. In addition to their practice facilities, they feature three championship golf courses. The Pete Dye Challenge course is almost 7,000 yards of challenging golf at its best. It uses many of Pete Dye’s custom designs and has large bunkers and waste areas. The Arnold Palmer course is a member favorite. Just over 6,800 yards, it has breathtaking landscaping and views all through the course. Desmond Muirhead designed the final course, known as the Dinah Shore Tournament course. This has been rated as Coachella Valley’s number one course and is home to the LPGA Kraft Nabisco Championship each year. Your options for living in the membership radius for this club include: Legacy at Mission Hills, Mission Hills community, and Legacy at Oakhurst. If you want to become a member of this exclusive, top-rate Mission Hills Country Club, contact us today to set up an appointment. Whether you’d like more information on homes or a tour of the properties that are for sale, we can help you with your needs. Call us now to get started. If you would like to see property at Mission Hills Country Club , please call us at the numbers below. Were committed to helping you find the home of your dreams.